East champs fought through three rounds of upsets, entering the postseason as the No. 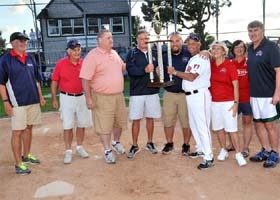 3seed in their division, before knocking off the second-seeded Orleans Firebirds, the top-seeded Harwich Mariners, and finally the Commodores, who were the No. 2 seed out West. 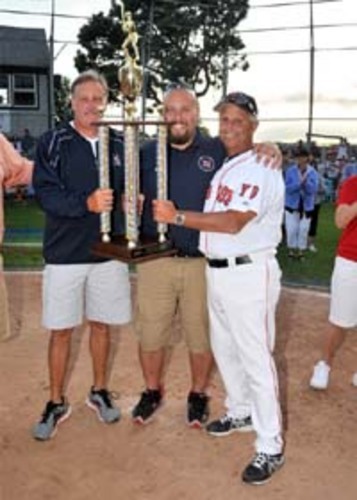 There was no doubt that they were the best team in the CCBL Playoffs, presented by Rockland Trust, and were well-deserving of this year’s title. 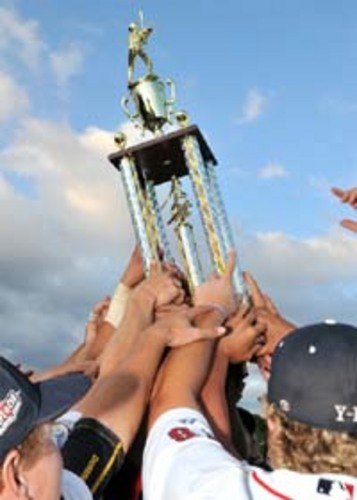 The 2014 Championship continues a tradition of winning for Y-D, who can add this year’s trophy to a shelf that holds titles from 2004, 2006, and 2007. It was an exciting and entertaining playoff run, as the Red Sox capped off another Cape League season in style with a big win. After defeating Falmouth 5-0 on the road in Game 1, Y-D returned home to Red Wilson Field for Game 2, hungry for a title. They sent Kevin Duchene (Illinois) to the mound, who had thrown a one-hit shutout in the rubber match against Orleans in his first playoff appearance. Falmouth countered with Kevin McCanna (Rice), their workhorse starter who had lead the league in innings pitched and also won his first playoff start in dominant fashion. However, the match-up ended up being an offensive battle, and Falmouth struck first. After three scoreless innings to start the contest, the Commodores finally broke through in the fourth. Boomer White (Texas A&M) hit an RBI double, and then was driven in on an error following a Jake Madsen (Ohio) single to put Falmouth up 2-0 quickly. Y-D fought right back in the bottom of the inning, loading the bases with a pair of singles and a walk, before Marcus Mastrobuoni (Cal St. – Stanislaus) pushed one run across and helped another run score on an error on the same play, promptly tying the game at two. Falmouth looked to pull away in the sixth inning, as they added two runs again, and again it started with an RBI double from White. He drove in Cameron O’Brien (West Virginia), who had doubled himself in the previous at-bat, and then White came home on a gap single by Austin Afenir (Oral Roberts). The two starters were out of the game by the end of the sixth. Duchene got the win, allowing just two earned runs on nine hits in six innings, while McCanna was saddled with the loss, as he gave up three earned runs on six hits in five innings. The big difference in the contest was who relieved the two starters. Falmouth’s bullpen attempts backfired, as their two relievers in the sixth allowed a combined three earned runs, and then Matt Eckelman (St. Louis) had his worst outing of the season, giving up a solo home run to Michael Donadio (St. John’s) in the eighth, as well as a double and two singles which added another run to make it 10-4. Meanwhile, Y-D star closer Phil Bickford (Cal St. – Fullerton) pitched three scoreless innings to close out the game, as he earned his third save of the playoffs. With the game-ending double play, the Red Sox stormed the field and celebrated with their teammates, coaches, team officials, and fans alike in a moment of great excitement and joy. For these collegiate players, the Cape League offers them the opportunity to come and learn and get better, but for their hard work to pay off with a championship is an amazing achievement. While it was a tough loss for the Commodores, whose championship drought continues and who also lost to Y-D in ’04 and ’07, they too should be proud of their achievements. As the two teams met in the handshake line, it was the perfect ending to an unbelievable series, playoffs, and Cape League season. Resilience was the story of the Red Sox in the 2014 season. Rubin described it the best: “I’m shocked. It’s been seven years since we’ve had it here in Yarmouth. It’s just unbelievable to see. I never though after beginning the season 5-11 that we’d be raising the trophy here in our own park in August.” They had a tough start to the season, yet fought back, and were the hottest team in the league in the final month of the season. They fell short right towards the end of the season and ended up as the third seed in the East, yet overcame that obstacle as well. They lost Game 1 to Orleans in the semifinals, yet came back to take that series. They got thumped by Harwich at home in Game 2 of the division finals, yet came from behind to win that deciding game as well. And when it mattered most, after falling behind the Commodores twice in this Game2 of the League championship, they were resilient and came back to win it all. Rubin summed it up, saying “The players clicked. The players were unbelievable. They said to me that the only ones stopping us right now is our own selves. 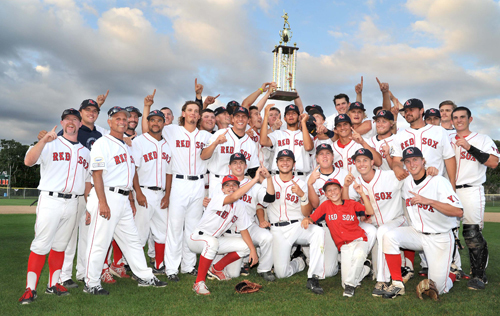 No one else can stop us.” The Red Sox were a fun team to watch, with great team chemistry and outstanding talent, and the league is proud to present them as the 2014 Cape Cod Baseball League champions.